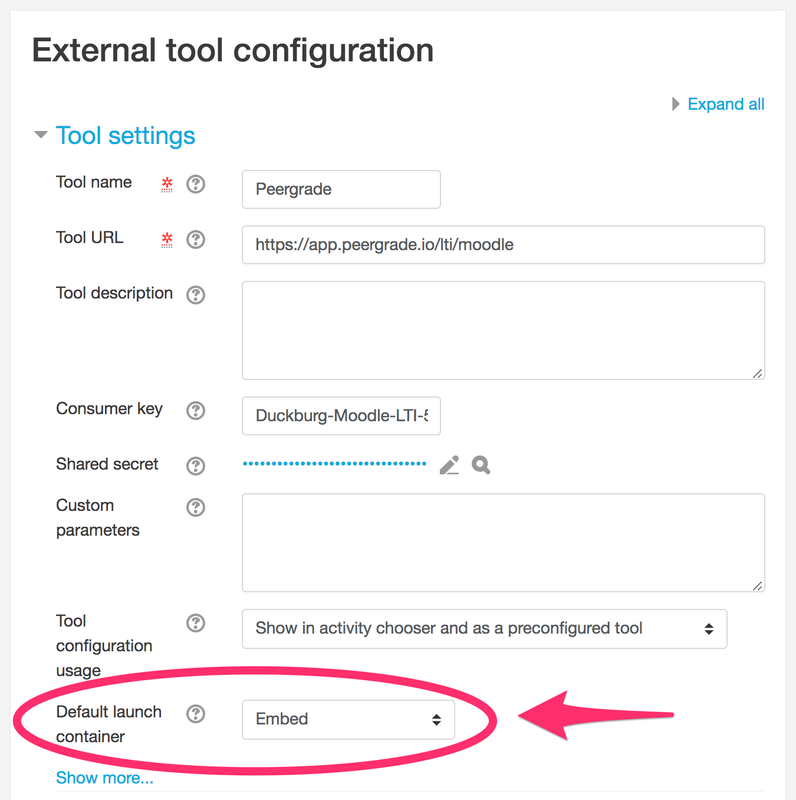 Setting up your Moodle instance with Peergrade should be done in two parts. 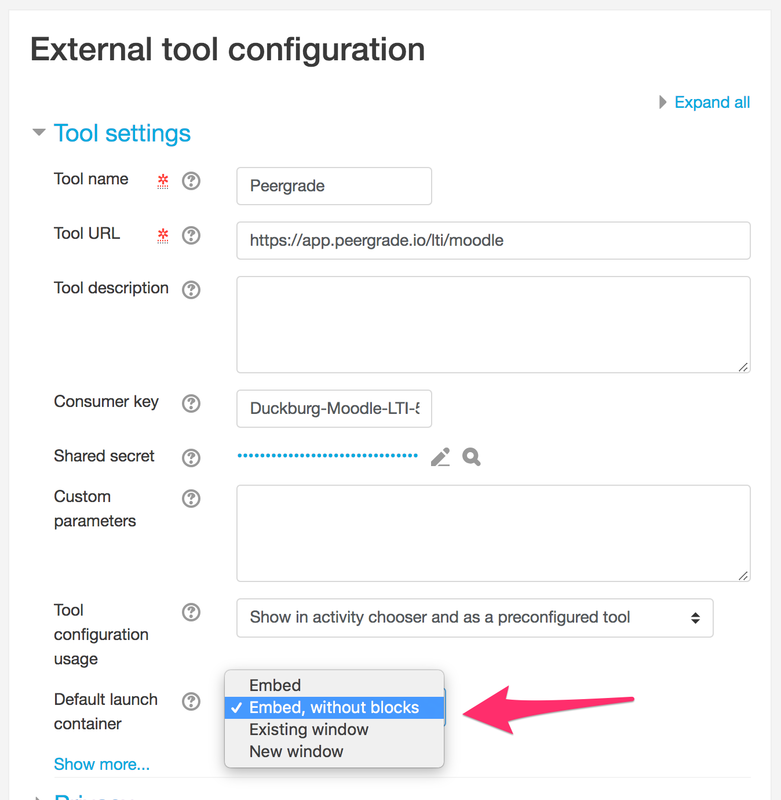 First, you need to add Peergrade as a web service and second, add it as a an external tool to your institution on Moodle. Having trouble with the size of the iframe in Moodle? Check the section "Iframe size" at the bottom of this article. First you need to log in to an account that has admin rights to your Moodle instance. Then, go to Site administration > Plugins > Web Services. 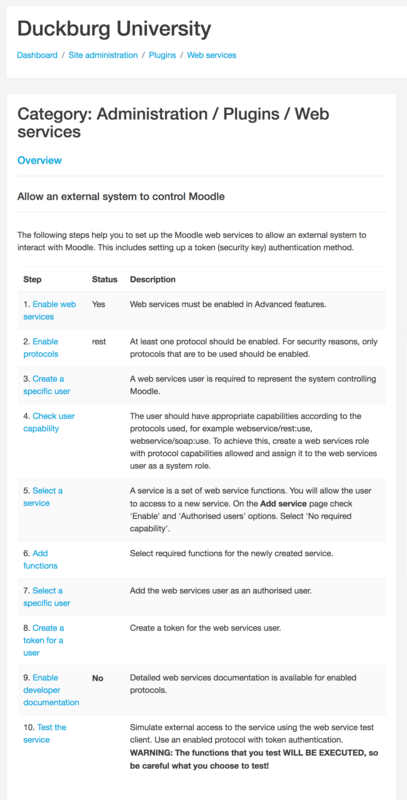 On this page Moodle should provide you with an overview of how to set up a web service. This guide will go through each step and explain what information you need to provide. Click on Enable web services, check the box and click Save changes. Navigate back to the guide and click on Enable protocols. Click the eye icon for REST protocol to enable it and click Save changes. Set the authentication method to Manual accounts. Anything except 'No login' should work though (See: The Moodle API docs). Set a password for the user. After you've set a password, open the dropdown for the authentication method again and select Web service authentication. Make sure the checkbox for "Force password change" is not checked. Add an email for the user. Any email that you have access to should work. When you've filled out the form click on Create user. Scroll to the bottom and click on Add a new role. Leave the first form untouched and click Continue. In context types where this role may be assigned check the box for System. Click on Create this role. 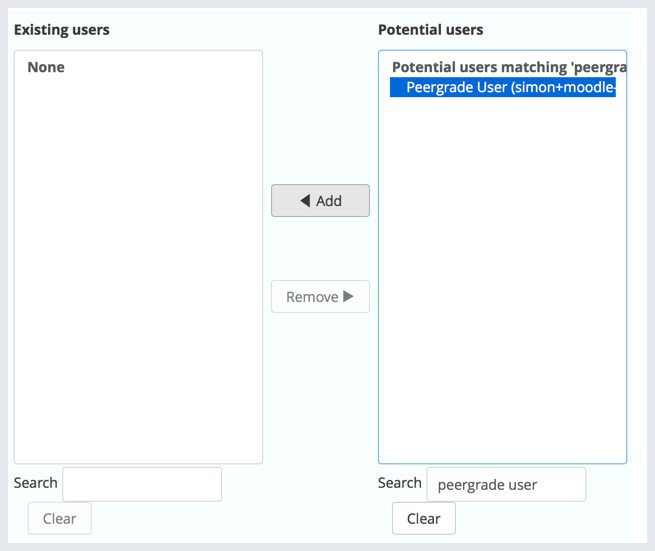 Search for Peergrade User in the search field under Potential users. Select it and click on the Add button between the two columns. The change will save automatically. Refresh the page to make sure that Peergrade User is in the Existing users column. Go to Site administration > Plugins > Web services > External services. At the bottom of the page click on Add to add a new web service. Give it the name Peergrade web service and the shortname peergrade-web-service. Check the box Authorised users only. core_enrol_get_enrolled_users:Get enrolled users by course id. core_group_get_course_groupings:Returns all groupings in specified course. core_user_get_users_by_field:Retrieve users' information for a specified unique field. Click on Add functions, check that all 6 functions are there and click on Add functions again. Back in the overview of external services (Site administration > Plugins > Web services > External services) click the Authorised users link in the row with Peergrade web service. Here you should add the Peergrade webservice user to the list of authorised users. Search for Peergrade User in the search input under Not authorised users, select it and click on Add. The change should save automatically. Refresh the page to make sure the user in the Authorised users column. At the bottom of the Web services page in the Site administration (Site administration > Plugins > Web services), scroll to the bottom and click the Add link under the Manage tokens section. On this page, for User you should select the Peergrade User and for Service you should select Peergrade web service. The IP restriction field can be left blank, and the Valid until fields can be left unchanged (disabled). You should now have a token key available. 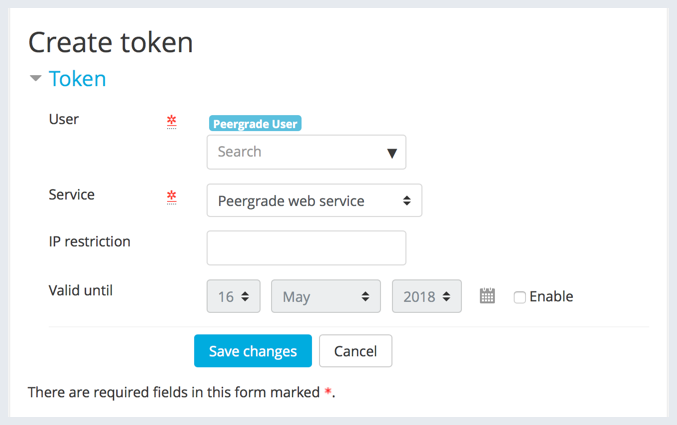 Inside Peergrade, go to your Institution dashboard > Settings > LMS integration, select Moodle and paste in the token and your platform's URL (https://www.example-platform-name.com) and click on Save changes. Now it's time to add Peergrade as an external tool. Go to Site adminsitration > Plugins > Category: Activity modules > Category: External tool and click on Manage tools. 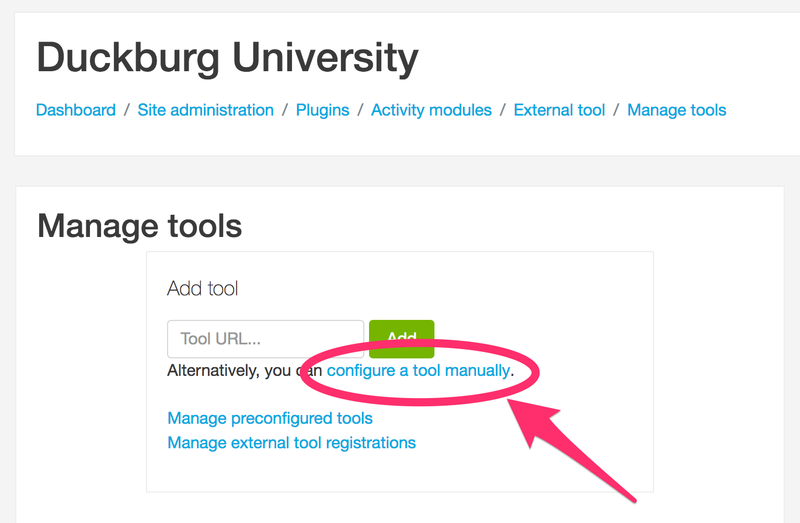 On the Manage tools page you should click configure a tool manually. 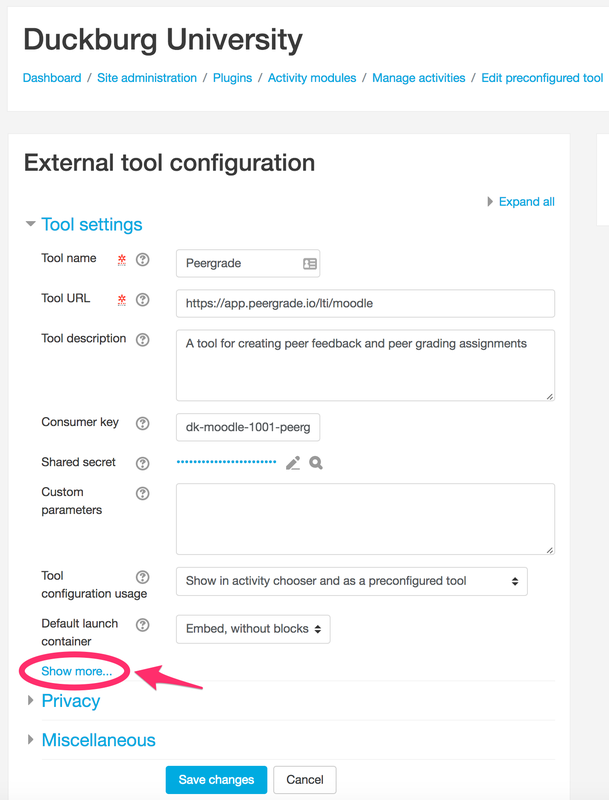 The Tool description should be "A tool for creating peer feedback and peer grading assignments"
The Consumer key and Shared secret is available inside Peergrade if you go to your Institution dashboard > Settings > LMS integration and select Moodle. Copy and paste them into their respective input fields in Moodle. For Tool configuration usage you should select "Show in activity chooser and as a preconfigured tool"
We recommend setting the Default launch container to New window. Then click the Show more... link. 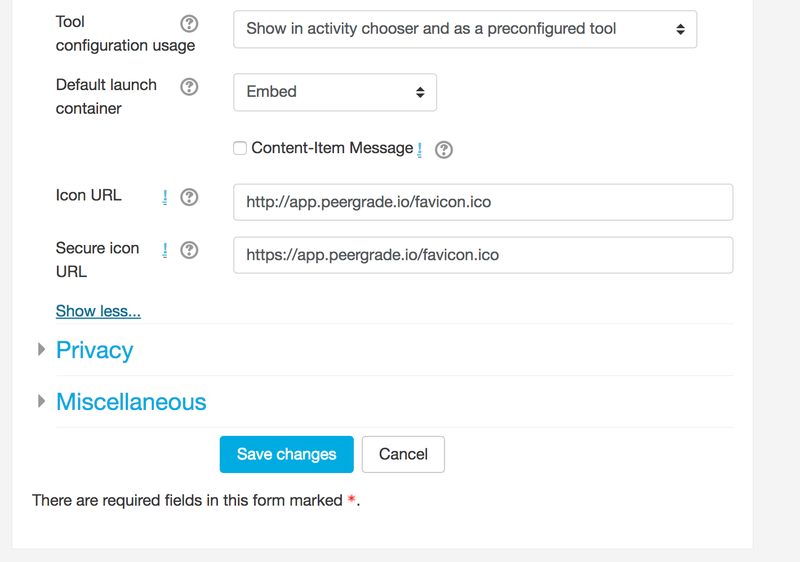 After this the Icon URL and Secure icon URL fields will appear. The Privacy and Miscellaneous sections can be left as-is. This is the default. Depending on your Moodle setup, this may or may not give you Peergrade iframe inside Moodle that is too small. 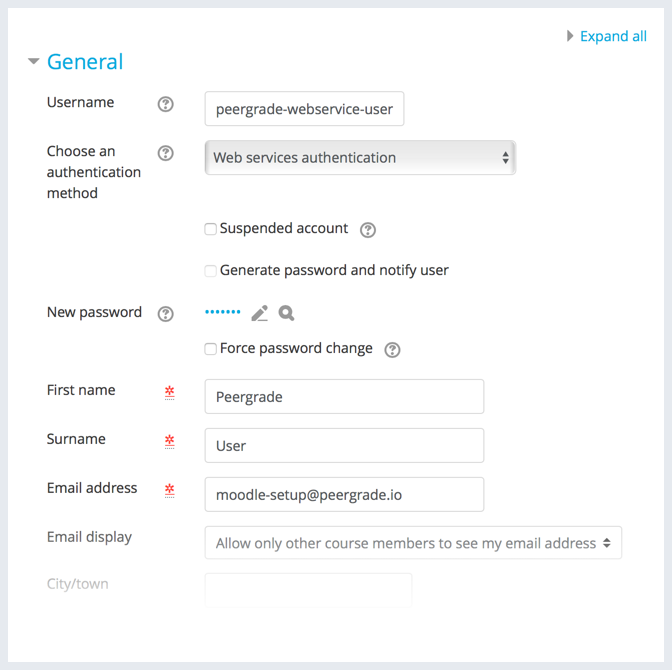 With this option, clicking a Peergrade activity in Moodle take you directly to Peergrade in the same window, replacing . This can make it hard for students and teachers to get back to Moodle, after having used Peergrade. For this reason, we recommend the New window option instead of this one.